We have several horses available on lease programs to approved breeders. Since our horse herd is quite large we just don't breed all the broodmares each year. This is your chance to try breeding to a cremello or perlino without having to permanently add the horse to your herd! We lease mares in a program where you may choose any of our mares to breed to any of our stalllions. We keep the mare for you and when the foal is born off it goes to you! Mocha is an extremely nice but small AQHA perlino stallion. Good conformation, nice temperament and very pretty movement. His bloodlines are full of champions, well known both nationally and regionally. He has all the baest of the Doc Bar bloodlines crossed on the champion Leo performer, Holey Sox. There are 4 national champion Hall of Fame Quarter Horses in Mocha's pedigree. With his perlino genes he can only produce buckskins, palominos or duns out of bay and chestnut mares. Nice stallion to be around. Under saddle and ridden on the trails, Mocha with his playful intelligent nature is a great candidate for Extreme Horse Events. 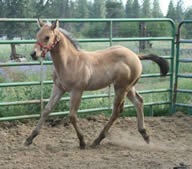 His first foal crop in 2008 of AQHA foals produced some very nice babies with good conformation and looks. Mocha is also avaiable for sale to the right buyer. No....he doesnt need a big fence like this...just were the only pictures I currently have of him!